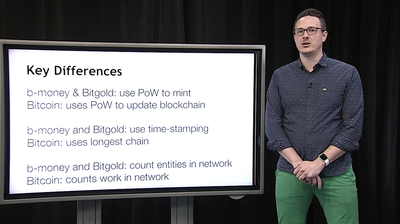 Earlier this year we made our online course on Bitcoin publicly available — 11 video lectures and draft chapters of our textbook-in-progress, including exercises. The response has been very positive: numerous students have sent us thanks, comments, feedback, and a few error corrections. We’ve heard that our materials are being used in courses at a few universities. Some students have even translated the chapters to other languages. Coursera. I’m very happy to announce that the course is now available as a Princeton University online course on Coursera. The first iteration starts next Friday, September 4. The Coursera version offers embedded quizzes to test your understanding; you’ll also be part of a community of students to discuss the lectures with (about 10,000 15,000 have already signed up). We’ve also fixed all the errors we found thanks to the video editing skillz of the Princeton Broadcast Center folks. Sign up now, it’s free! We’re closely watching ongoing developments in the cryptocurrency world such as Ethereum. Whenever a body of scientific knowledge develops around a new area, we will record additional lectures. The Coursera class already includes one additional lecture: it’s on the history of cryptocurrencies by Jeremy Clark. Jeremy is the ideal person to give this lecture for many reasons, including the fact that he worked with David Chaum for many years. Textbook. We’re finishing the draft of the textbook; Chapter 8 was released today and the rest will be coming out in the next few weeks. The textbook closely follows the structure of the lectures, but the textual format has allowed us to refine and polish the explanations, making them much clearer in many places, in my opinion. I’m excited to announce that we’ll be publishing the textbook with Princeton University Press. The draft chapters will continue to be available free of charge, but you should buy the book — it will be peer reviewed, professionally edited and typeset, and the graphics will be re-done professionally. Finally, if you’re an educator interested in teaching Bitcoin, write to us and we’ll be happy to share with you some educational materials that aren’t yet public. The process of influencing government action has undergone a significant transformation in the age of the smartphone. Of course, the traditional lobbying business continues to thrive, with companies, trade associations and public interest advocacy groups relying on experienced experts to plead their cases in Washington, DC, and throughout the country. What the smartphone has done, however, is expand the ways that non-professionals can influence the political system. I’ll focus on three ways that regular people have been significantly influencing the machinery of government between election days through the Internet and mobile devices. Post-Ferguson, MO, the civil rights movement has been re-born, notably with #BlackTwitter playing a central role. What has been striking to me is that the movement has been energized not primarily by new laws passed by the country’s first African-American President, but by a series of powerful videos and images mostly from smartphone cameras: Walter Scott shot by Michael Slager in the back and ear while fleeing the police across a grassy lot; Dylann Roof wearing a jacket with the flags of Apartheid-era South Africa and Rhodesia; and the stream of photos and videos that launched the #BlackLivesMatter movement.The 1960s civil rights movement that, in part, led to the passage of the Voting Right Act of 1965 was defined largely by protests, marches and sit-ins: organized and coordinated activities designed to pressure politicians into taking actions that would ensure African-American access to the political process. Without such a centrally coordinated effort, shared videos of disparate individuals have been a significant factor in the Justice Department’s decision to launch investigations of police forces in several cities and in the South Carolina political establishment’s decision to take down the Confederate Flag on the South Carolina Capitol grounds. While the #BlackLivesMatter movement is currently working to show its effectiveness as a coordinated political operation hoping to influence the outcome of the Democratic and Republican primaries, it is still unclear whether it can transition seamlessly into a more traditional advocacy role or if its strength is more in its members’ ad hoc presence in local communities across the country. Leading technology companies are increasingly soliciting their users to take political action on their behalf to defend controversial business models from regulation, support new programs, and promote their moral values in active political battles….We’re being introduced to a new lever of corporate influence on democracy. This changing approach to corporate lobbying, particularly of state and local officials, is logical in an era of online, mobile activism and slacktivism. It’s easy to take a political stance by clicking a link while waiting for lunch or the bus, so why not ask sympathetic users to do so when it benefits your brand? Because people often define themselves through brand choices – iPhone vs. Galaxy – and social media platforms – LinkedIn for work and Instagram for vacation, companies can harness that self-identification and goodwill towards their desired political ends. For the public, the benefits of these efforts are getting more people to engage with tech policy issues, communicate their preferences to their elected officials, and advocate for organizations with missions they support. However, I agree with Mr. Stempeck that a significant concern is that this kind of lobbying can lead to uninformed activism, where companies control the messaging and users click to join a campaign without considering counterarguments. The data that people submit to cities through 311 posts, 911 calls, tweets and blog posts has a tremendous influence on “responsive cities,” as Stephen Goldsmith and Susan Crawford have tagged them. Public safety, recreation and transportation options are being decided in cities across the country based on aggregated feedback from residents. Therefore, it is increasingly important for people to participate digitally. While the tools have changed, the squeaky wheel still gets the grease. Recently, I had a conversation with my local City Councilperson in Washington, DC, and we discussed his desire to develop ways to generate hyper-local data from within his Ward and use that information to promote economic growth. Companies such as IBM and Alphabet’s new Sidewalk Labs recognize that there is tremendous value in helping both cities and companies to increase local connectivity and further analyze the resulting data. My hope is that the ongoing sharing of requests, photos, and tweets will allow residents’ voices to be noticed continually, not just in the lead up to election days. While the people who fought for the Voting Rights Act probably could not have imagined Twitter, activists’ desires haven’t changed – people should have the ability to participate in our democracy and have a voice in the decisions made by their representatives. Today, technology that we carry around all the time anyway is helping make that possible. Hi, I’m Joanna Bryson, and I’m just starting as a fellow at CITP, on sabbatical from the University of Bath. I’ve been blogging about natural and artificial intelligence since 2007, increasingly with attention to public policy. I’ve been writing about AI ethics since 1998. This is my first blog post for Freedom to Tinker. Will robots take our jobs? Will they kill us in war? The answer to these questions depends not (just) on technological advances – for example in the area of my own expertise, AI – but in how we as a society determine to view what it means to be a moral agent. This may sound esoteric, and indeed the term moral agent comes from philosophy. An agent is something that changes its environment (so chemical agents cause reactions). A moral agent is something society holds responsible for the changes it effects. Should society hold robots responsible for taking jobs or killing people? My argument is “no”. The fact that humans have full authorship over robots‘ capacities, including their goals and motivations, means that transferring responsibility to them would require abandoning, ignoring or just obscuring the obligations of humans and human institutions that create the robots. Using language like “killer robots” can confuse the tax-paying public already easily lead by science fiction and runaway agency detection to believing that robots are sentient competitors. This belief ironically serves to protect the people and organisations that are actually the moral actors. So robots don’t kill or replace people; people use robots to kill or replace each other. Does that mean there’s no problem with robots? Of course not. Asking whether robots (or any other tools) should be subject to policy and regulation is a very sensible question. Nevertheless, I hope that by continuing to educate the public, we can at least help people make sensible conscious decisions about allocating their resources (such as time or attention) between real humans versus machines. This is why I object to language like “killer robots.” And this is part of the reason why my research group works on increasing the transparency of artificial intelligence. However, maybe the emotional response we have to the apparently human-like threat of robots will also serve some useful purposes. I did sign the “killer robot” letter, because although I dislike the headlines associated with it, the actual letter (titled “Autonomous Weapons: an Open Letter from AI & Robotics Researchers“) makes clear the nature of the threat of taking humans out of the loop on real-time kill decisions. Similarly, I am currently interested in understanding the extent to which information technology, including AI, is responsible for the levelling off of wages since 1978. I am still reading and learning about this; I think it’s quite possible that the problem is not information technology per se, but rather culture, politics and policy more generally. However, 1978 was a long time ago. If more pictures of the Terminator get more people attending to questions of income inequality and the future of labour, maybe that’s not a bad thing.